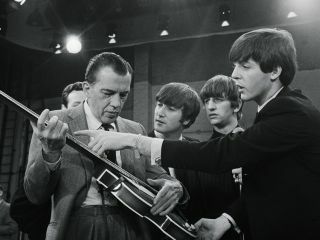 When originally broadcast, The Beatles' debut appearance on The Ed Sullivan Show was the most-watched TV program in history. But if you think you've seen all of the footage of the band's first and subsequent Sullivan Show airings, think again. On 7 September, UME will reissue The 4 Complete Ed Sullivan Shows Starring The Beatles. The 13 minutes of extra footage includes an ad for Beatles dolls and Sullivan's interview with members of the band, neither of which has been seen since the show originally aired. An option to choose either mono sound or a 5.1 remix will be included with the newly-remastered set, which will also incorporate the commercials that originally aired with the shows. Broadcast on 9 February 1964, The Beatles' appearance on Sullivan's variety show was seen by 73 million viewers in the United States, a figure that at the time represented 86 percent of all televisions that were switched on.